I recently moved to Southern California from Chattanooga, Tennessee, where it’s hot AND humid during the summer. “It’s a dry heat,” they infamously say about the SoCal weather. I can tell you one thing, though. It’s not so dry when you’re trying to do anything active outside. In Tennessee, you basically swim through the humidity if you want to go for a run. In California, you swim because of the sweat. In either place, when it’s in the dead of summer, I absolutely hated exercising outside. And in Tennessee, the gym I joined ($10 a month!) was 25 minutes out of my way from home and/or work. Basically, I didn’t work out that much. I did enough to complete my first and second 5k runs last year (“run” is a loose term here) with the help of a marvelous co-worker who trained with me. After I moved to California, I was stoked because the gym was within walking distance to me, and it’s included in tuition. I told myself I’d be there every day it was open. After about two weeks of going pretty regularly, I realized I hated it. I hated it. I can’t put my finger on it--the intimidation factor of the weight lifters/super fit people that you look at and go, “You don’t even NEED to be here! Go home!”, the lack of availability of the machines on a particularly busy morning, or the repetitive nature of said machines. I don’t know what it is, but I really dislike going to the gym. That is, until I discovered kickboxing. After I had the epiphany of how much I really hated going to the gym, I realized that I needed to find something I really, truly enjoy doing. I tried running. Not my thing. If you’re a Parks & Recreation fan, one of my favorite quotes from the show is from the character Anne Perkins: “I mean, I know running is good for you, but at what cost? !” I can definitely relate. I know some people are all about running, and that’s fantastic. I’m actually very jealous. I wish I could be enthusiastic about it. I tried lying to myself and everybody around me when I was training for the 5k. “Oh yeah, I love it! The runner’s high is amazing once you hit your stride.” Nope. Sometimes mind over matter only goes so far. I digress. About a month after I moved here, I did some intense research (aka Google and Yelp). For some reason, when I started thinking about something I might enjoy doing, kickboxing popped into my head. I had never done it before, but for some reason, the thought of kicking and punching things repeatedly sounded extremely appealing (no, I don’t have anger issues). And doing that all in the name of health? Sign me up! I found a local kickboxing gym about 10 minutes away from where I live, and they offered three free classes. I emailed the owner and she told me to come on in. I instantly fell in love. I was nervous at first, but everybody was extremely welcoming. It’s a small mom and pop gym, too, which I love. It definitely has a more appealing feel to it than a huge chain gym. Everybody was of all different shapes and sizes and skill levels, so I didn’t feel as out of place as I initially thought I would. Eventually, I bought a Yelp deal which included boxing gloves (yeah, I got pink gloves, what of it? ), wraps, the member sign-up fee waived, one month of unlimited membership, and a monthly discount should you choose to sign up as a regular member after the first month. I went as much as my schedule would allow that month, and signed up for a year membership after that. Also, I now have a friend to go with who signed up after she saw that I had been going, which helps with the motivation side of things. 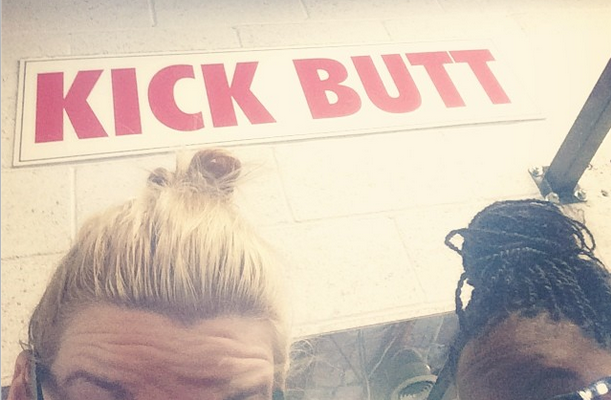 I have a few favorite things about kickboxing. I can’t pick just one. So here’s a list! It never gets easier. The instructors always challenge you, and you set your own pace, so once you’ve improved, you go harder than before. It’s a full body workout. I think I discovered muscles I never even realized existed. It’s cardio and strength training at the same time. Gotta love those punching bags. The music. I love a good playlist, and all the instructors have different preferences in music, so it’s always cool to hear what we’re going to be working out to for that day’s class. Stress relief. There is absolutely nothing like being able to envision your problems in the form of a boxing bag and literally kicking and punching them until you feel better. It’s magic. It really is. Bad day at work? Punch it in the proverbial face. Taxes due soon? Kick the IRS right in the moneymaker. I promise you it helps. It’s also a great form of self-defense if you ever get into a situation where you need to roundhouse-kick somebody where it hurts. That’s not a joke, either. It honestly makes me feel empowered. Also, don’t mess with me. I guess the point of this post is to encourage you to find something that you love doing and run with it (pun most definitely intended). I know stress relief and all the other benefits I mentioned can be found in other forms of exercise, but if you’re stuck in a rut and need something new to try out, I highly, highly recommend finding a kickboxing gym. 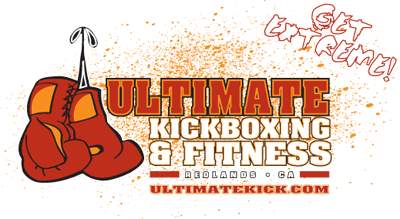 If you’re in the Inland Empire, check out Ultimate Kickboxing and try out their free classes. They also offer some other fitness classes as well.